Buy TurboNote+ now and enjoy uninterrupted access to all the great time-saving features TurboNote+ provides. 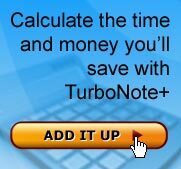 It's cost-effective -- most people save enough time and money using TurboNote+ to pay for the license in under a week (check out your savings with our handy calculator here). Pay via credit card or your Paypal account using the quick form below. See our refund policy and contact information here. I want a user TurboNote+ license.